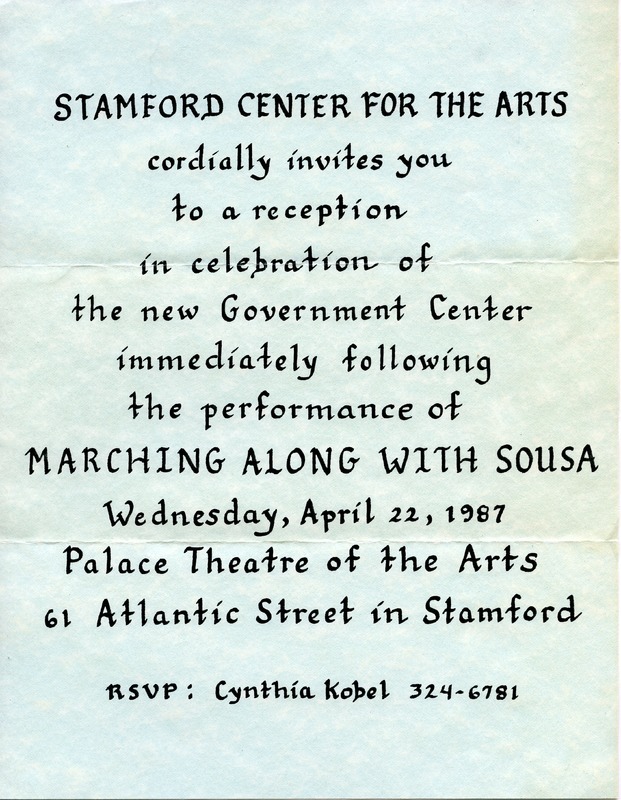 Invitation from the Stamford Center for the Arts to am celebratory reception for the opening of the Stamford Government Center on April 22, 1987. The reception was held at the Palace Theatre of the Arts on Atlantic Street. There was a performance by Marching Along with Sousa preceding the reception. Stamford Center for the Arts, “Stamford Center for the Arts Invitation to Stamford Government Center Opening Reception,” Ferguson Digital Archives, accessed April 25, 2019, http://www.fergusonlibraryarchive.org/FL.tellyourstory.sd/FL.tellyourstory.sd.019.